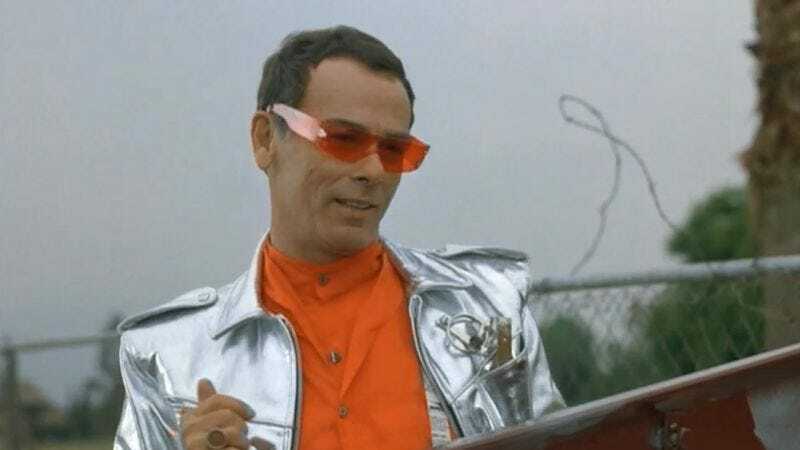 Dean Stockwell has done it all. Before he played the crankiest Cylon on Battlestar Galactica, he was the son of Nick and Nora Charles in the worst Thin Man movie, a warlock in a pitiable H.P. Lovecraft adaptation, a CIA badass in a preposterous samurai-themed episode of Miami Vice, Carol Burnett in Blue Velvet, and, most famously, a hologram from the future in Quantum Leap. Yet the world seems to have forgotten the day he went on the greatest adventure a former child actor can undertake: a journey into the world of rap. This clip from “Shock Theater,” preserved on Barb Cast’s YouTube channel, may not vault Stockwell onto your list of greatest MCs. But it does prove, if any doubt remained, that the man is a consummate pro. Not only does he commit to the premise that an original rap song is the best way to teach someone how to read, he belts out every half-rhyme with the gusto befitting party animal Admiral Al Calavicci. The script also suggests that he and Scott Bakula spent their free time in the future year of [Consults smartphone made of Mega Bloks.] 1995 freestyling together, which is a fine thing to imagine. Al’s listener in “Shock Theater,” Tibby, does indeed become literate after hearing the Alphabet Rap. If anyone else has stumbled onto this clip and suddenly learned to read: welcome! Please enjoy the rest of The A.V. Club website, which includes a roundup of standout Quantum Leap episodes.